M Haseeb A Hameed Properties (Pvt) Ltd In Words..
We live in a fast paced world where most industries are evolving and changing in the blink of an eye! This rapid change not only changes the path of the world but also the environment we live in. The real estate and construction industry in Sri Lanka and Southeast Asia is no exception to this change. Over the past few years it has taken a revolutionized turn into an age where new technology and techniques are being used in the industry. The expansion of the working class and desire for better living standards have set high expectations for low cost and high quality reliable housing, commercial / industrial buildings at a time where land prices are volatile. We strive to make life easier for our clients by shouldering the responsibilities that come with properties and construction. In addition to this our services include arranging loan facilities with banks for your real estate and construction needs. Real estate services are handled via our franchise office RE/MAX Infinity under the guidance of RE/MAX Sri Lanka. RE/MAX is a global real estate network of Franchisee-owned-and-operated offices with 106,708 sales affiliates in over 7000 offices in 102 countries worldwide. RE/MAX Infinity is the second franchise office in Sri Lanka and is based in Colombo 10. We at RE/MAX Infinity together with our holding company M Haseeb A Hameed Properties (Pvt) Ltd is well equipped to serve all our customers Real Estate needs with a team of proffesional Sales Affiliates who are qualified to analyze and help customers satisfy their Real Estate requirements. Hussam Hameed is the Chairman / Managing Director of the company and has experience in the field of Accounting, Real Estate and Banking. He is a member of the International Association of Book Keepers - UK and has a Certificate in Islamic Banking and Finance. Hussam is the Founder President of the Council for Islamic Finance Professionals and has been part of several other professional societies. Hussam has been very keen about the Real Estate, Construction and Landed Proprietorship Industry in Sri Lanka and was instrumental in the set up of M Haseeb A Hameed Properties (Pvt) Ltd. Hussam was also responsible for the set up of www.propertyhub.lk which is the company website and the successful implementation of 360 view Real Estate photos (Introduced first to the Real Estate industry of Sri Lanka). 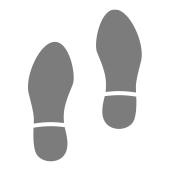 He looks forward to steer the company towards achieving its vision and its mission. 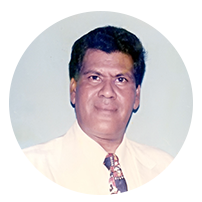 Late Mohamed Haseeb Abdul Hameed was the founder chairman of M Haseeb A Hameed (Pvt) Ltd and was a respected individual in the field of construction and interior decorating. He was a Member of the British Institute of Interior Design. During his period of service many vast projects were established from the 1970's till 2007 for which Haseeb earned a high and esteemed reputation especially among diplomatic mission / offices in Sri Lanka. Haseeb was a versatile businessman who was highly respected among the elite business circles in Sri Lanka and has held several honorary positions in institutions such as Lions Club etc. 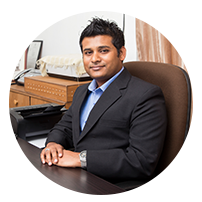 Haseeb always believed that Sri Lanka will be the hub of Real Estate Excellence considering the natural resources and industry talent that mother lanka possesses. Nandana Fernando is the Head of our Heating & Ventilation Air Conditioning Operations (H.V.A.C). He is a well-qualified Air Conditioning Technician and holds a certificate from the Apprentice Board of Sri Lanka. 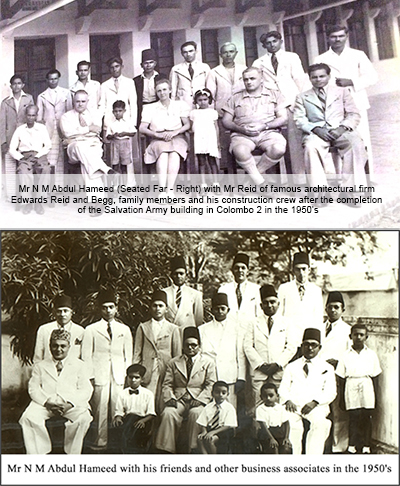 Hameed Building Contractors have been in business from the 1930's and was founded by Mr N M Abdul Hameed who earned a high and esteemed reputation in the construction field. N M Abdul Hameed worked closely with the then reputed Architecture firm Edwards, Reid and Begg and was entrusted with many projects in the city of Colombo and Suburbs which were accomplished successfully. 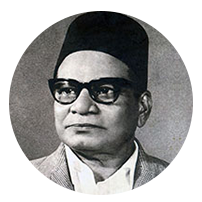 We at M Haseeb A Hameed Properties (Pvt) Ltd aspire to follow the footsteps and legacy of Mr N M Abdul Hameed.